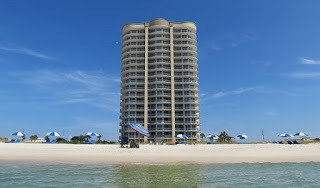 Mirabella beachfront condominium home for sale in Perdido Key FL. The resort property has beautiful tile flooring and is well furnished throughout the living areas. Comfortable enough to make it your home, this amazing resort home could be the ideal private residence for you and your family. Prepare to be wowed by the interior upgrades and appointments, including beautiful granite counter-tops, tile backsplash and stainless steel appliances. The kitchen features under cabinet and recessed lighting, a pantry closet, a built-in Kitchen Aid wine cooler and an island crowned with a stylish lantern chandelier. A separate wet bar with its own sink and ice maker is situated next to the dining area. Each of the bedrooms has balcony access and all have tile flooring laid in a handsome wood plank style. All baths were updated in 2013 with new Kohler toilets, new tubs, sinks, hardware and accessories. 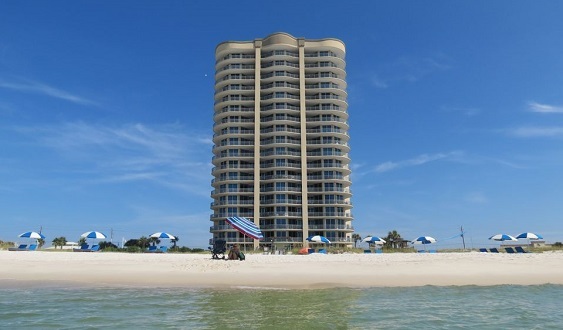 So much more…come see this exceptional gulf-front condominium home today!